This is a design for armour for Henry Le Scrope, 9th Baron Scrope of Bolton (1534-92) comes from an album of designs known as the Almain Armourer's Album, or Jacob Album. The Album is one of the Victoria and Albert Museum's great Elizabethan treasures. It was compiled between 1557 and 1587 by Master Armourer, Jacob Halder, and records, in vivid detail, notable commissions at the English Royal Armoury in Greenwich during those years. This design shows a heavy cavalry armour for battle with supplementary pieces for use as light cavalry or in jousts and tournaments. The supplementary pieces include a reinforcing breastplate, a burgonet (open-faced helmet) a grandguard (protoector of the left shoulder and neck) for the joust, a locking gauntlet to give an unbreakable grip on a sword during the tourney and horse armour including saddle steels and a shaffron (face guard). The design is unpainted but has highlights shaded in light blue to denote that the armour should be finished in bright steel. It is decorated with vertical bands of etched decoration resembling the embroidery on contemporary doublets. The bands consist of alternatingsegments in white and gold, similar to the work of the Augsburg etcher, Jorg Sorg. The designs in the album are stencilled, inked and painted with watercolour. This design is annotated 'My Lorde Skrope'. Henry Le Scrope, 9th Baron Scrope was a lifelong supporter of Elizabeth I, earning prosthumous praise from her in 1592 for his loyalty. He was a Marshal of the Army and served at Leith in 1559 when the English besieged the town and attempted to break the Franco-Scottish alliance. From around 1560 to 1591, Scrope was Warden of the West Marches and Captain of Carlisle, and in 1584 was made a Knight of the Garter. This armour does not survive. 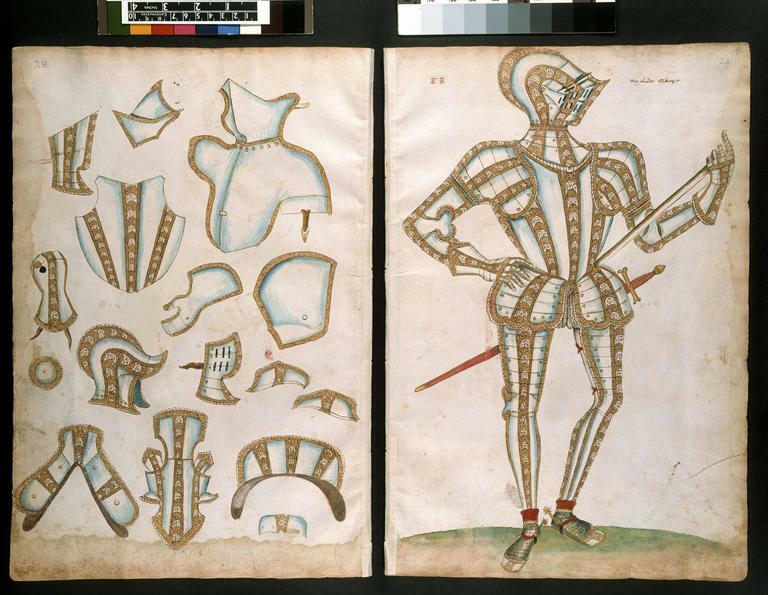 The production of armour was a highly sophisticated process. The designs in the Album record armours whose manufacture combined the skills of the artist, the tailor, the blacksmith, the goldsmith, the engineer and the locksmith. Their use demanded the skills of the courtier, the soldier, the diplomat, the sportsman, the actor and the daredevil. Double-page design for armour for Henry Le Scrope, 9th Baron Scrope of Bolton (1534-92) showing a heavy cavalry armour for battle with supplementary pieces for use as light cavalry or in jousts and tournaments. The main figure is on the right hand page and stands on a green surface signifying grass, and faces right. The supplementary pieces are on the left hand page. The supplementary pieces include a reinforcing breastplate, a burgonet (open-faced helmet) a grandguard (protoector of the left shoulder and neck) for the joust, a locking gauntlet to give an unbreakable grip on a sword during the tourney, and horse armour including saddle steels and a shaffron (face-guard). The design is unpainted but has highlights shaded in light blue to denote that the armour should be finished in bright steel. It is decorated with vertical bands of etched decoration resembling the embroidery on contemporary doublets. The bands consist of alternating segments in white and gold, similar to the work of the Augsburg etcher, Jorg Sorg. The design is stencilled, inked and painted with watercolour and is annotated 'My Lorde Skrope'. This design shows a heavy cavalry armour for battle with supplementary pieces for use as light cavalry or in jousts and tournaments. The supplementary pieces include a reinforcing breastplate, a burgonet (open-faced helmet) a grandguard (protoector of the left shoulder and neck) for the joust, a locking gauntlet to give an unbreakable grip on a sword during the tourney and horse armour including saddle steels and a shaffron (face guard). The design is unpainted but has highlights shaded in light blue to denote that the armour should be finished in bright steel. It is decorated with vertical bands of etched decoration resembling the embroidery on contemporary doublets. The bands consist of alternating segments in white and gold, similar to the work of the Augsburg etcher, Jorg Sorg. The designs in the album are stencilled, inked and painted with watercolour. The Almain Armourer's Album contains 29 designs for armour on 56 sheets, plus one sheet of additional components. The first two in the series are marked MR for Mary Tudor (r. 1553-58), the rest, produced during the reign of Elizabeth I (r. 1558-1603), are marked ER. 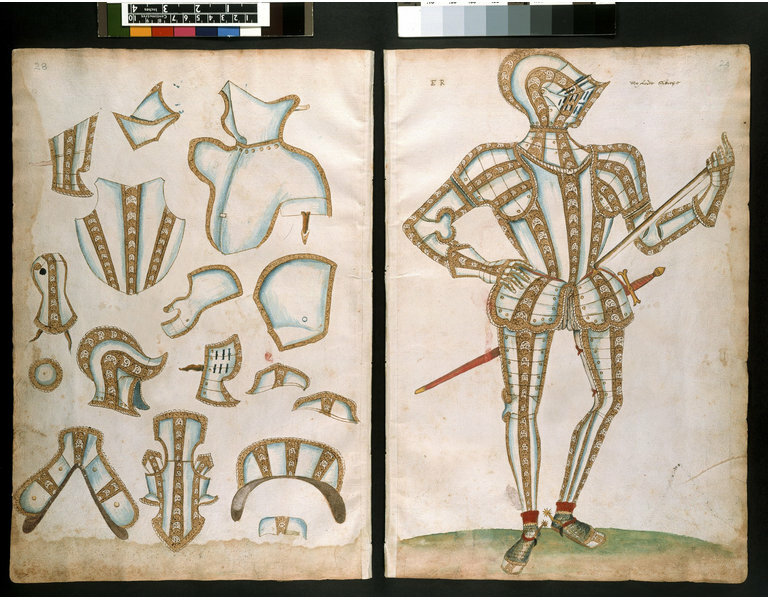 Each design shows a figure in cavalry armour, posed to reveal as much of the armour as possible, with a sheet opposite showing pieces of exchange for converting the armour for lighter cavalry, infantry, tilting or tournament use. The stencilled designs, hand-coloured and annotated by Halder with the names of the noblemen who commissioned them, were probably working designs. Several of the armours produced from the drawings survive, some with minor alterations from design to finished product. The album is incomplete. A few lost drawings have left imprints on the backs of other sheets. Watermarks show that the paper on which the designs were drawn was imported from the south of France. The artist who produced the designs was Jacob Halder, one of many German or 'Almain' armourers working at the Greenwich Armoury during the 16th century. Originally from Landshut, Germany, he is first recorded in the 1558 list of the Almains working at the Armoury. Halder was Master Workman at Greenwich from 1576 to 1607 and died in 1608. His contribution to the history of English armour cannot be overemphasised. He led the workshop at the peak of its creativity. Under his mastership, a combination of high quality construction and a prevailing fashion for outrageously shaped and coloured clothing brought Greenwich armour to its full flowering. From his workshop came some of the most magnificent forged, etched, gilt and blued armours ever made. His album of designs is also the key to understanding the place of armour at the Elizabethan court. The Almain Armourer's Album reads as a Who's Who of the Elizabethan court. Before the Album's emergence on the market in the late 19th century, the origins of many surviving Greenwich armours were not known. Robert Dudley, Earl of Leicester, commissioned several armours from Greenwich. Two designs in the album are annotated for him (D.588&A-1894; D.593&A-1894). Among Dudley's royal appointments, he was Master of the Horse and a member of the Privy Council. He exerted a powerful influence as both a politician and member of the Royal Household. Dudley was known by his rivals as 'the favourite' for his deep emotional ties with the Queen, and by Elizabeth herself as her 'eyes'. 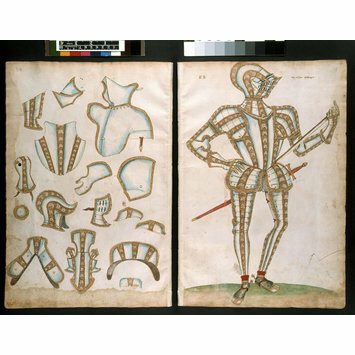 Dudley's armours shown in the album do not survive, although an armour made for him by the Greenwich workshop in around 1575, is in the Royal Armouries' collection in Leeds (Mus. No. II.81, VI.49). Sir Christopher Hatton, had at least three, possibly four, armours in the album, elements of which survive from all of them (D.600&A-1894; D.602&A-1894; D.606&A-1894; possibly D608.&A-1894). His skilful fighting and dancing during tournaments brought him to the Queen's attention and he achieved the roles of Gentleman Pensioner in 1564 and Captain of the Guard in 1572. He entered the Privy Council in 1577 and ten years later was Lord Chancellor. His rise to power and lavish patronage of the arts, left him £42,000 in debt. His spectacular armour commissions, etched with lovers' knots and symbols of his romantic obsession with the Queen, were typical of his extravagant spending. The most dominant commissioner of armour in the Album was Sir Henry Lee (1533-1611). He also used his armour to express his devotion to the Queen. Three armours in the album are annotated for Lee, one of which, Halder notes, was from 'beyonde see', which he decorated and supplemented (D.599&A-1894). The other two were Greenwich productions. One survives almost intact in the collection of The Worshipful Company of Armourers and Brasiers (D.604&A-1894). It was commissioned by Lee to fight the against the Spanish Armada. Elements of the other to survive, etched and gilded with quatrefoils and strapwork, testify to the magnificence of the perhaps most spectacular design in the album (D.604&A-1894). By Royal appointment, Lee was Master of the Armoury from 1578-1611, the 16th-century equivalent of its Chief Executive. He would have worked closely with Jacob Halder, who was the Master workman. The Greenwich armoury operated from around 1514 to around 1630. Henry VIII (r. 1509-48) established the Armoury as a key component in his drive to broadcast his image to the world as a modern, formidable king. He wanted his Armoury to rival the great workshops of Germany and Italy. Under Henry, the English court employed the finest armourers, artists, goldsmiths and engravers to turn armour and weapons simultaneously into works of art and death. Where the skills were not be found locally Henry imported them. Initially he invited armourers from Brussels and Milan to produce armours both for his own use and for diplomatic gifts. The first 'Almains', the German armourers Henry came to favour, began work in 1515. Henry built his Armoury on the south bank of the Thames near Greenwich Palace. The site is now a lawn in front of the National Maritime Museum. The location, near the river, meant there was a ready supply of water to power the mills. It also kept the workshop away from London where tension with the local guild over the employment of foreign craftsmen occasionally turned riotous. The first master of the Greenwich armoury, Martin van Royne, headed a staff of around 22, made up of hammermen who shaped the armour, millmen who burnished the metal, locksmiths who assembled and articulated the armour as well as labourers, apprentices and administrators. The armoury also had a mercury gilder, paid less than everyone else despite the dangers of his work. The first generation of armourers was from overseas but gradually English armourers appeared on the staff and became 'Almains'. The Album comes from the second great period of the Armoury's history. The first 30 years had seen the Armoury producing armours for the King and a very few privileged noblemen. This was an outward looking period radiating Henry's aura across Europe. Under Elizabeth I (r. 1558-1603), however, the Armoury became more inward-looking. This was an era in which Elizabeth's courtiers were obliged to compete for her favour by visible displays of devotion, bravery and theatricality. The armours were lavishly decorated, in keeping with contemporary fashion, but this should not suggest they were merely for show. These were battle-ready armours. Some of the later designs in the album are for armours commissioned to face the threat of Spanish invasion in 1588. After Jacob Halder's death in 1608 the Armouries were run by William Pickering, an Englishman with a distinguished career with the Armourers' Company. Some superb armours were produced, notably that of Henry, Prince of Wales in 1611 (Royal Collection, No. WIND.678) but both demand and output declined. In 1630 a royal commission recommended the workshop should close. In 1642 a London armourer called Edward Ansley, was asked to retrieve the remaining royal armour from Greenwich and two years later it was moved to the Tower of London, where, in the 1660s, it was displayed as the 'Line of Kings' depicting the kings of England from William the Conqueror (in a Greenwich armour of around 1590) to Charles II. The present day Royal Armouries Museum has its origins in this display. The armours shown in the album were made of steel. The various components were made-to-measure around the body-shapes and biomechanics of their individual patrons. The articulated plates of the arms and legs were strapped together on the inside and the various elements of the armour were assembled and joined with hooks and clasps. It took practice to be comfortable in armour but, contrary to popular myth, its flexibility enabled its wearer to walk, run, sit and mount a horse unaided. The main discomfort was over-heating rather than the weight of the armour, which was distributed around the body. The best armour moved naturally with its wearer. The Spanish writer Luis Zapata claimed it was 'most unseemly for a jouster to move about in armour rattling like kettles'. The Greenwich workshop imported good quality medium carbon steel for the first few decades it operated but it was not metallurgically advanced enough to harden it effectively. Under the mastership of Erasmus Kirkenar, between 1544 and 1567, the means to harden steel without warping it, were solved by slack quenching, leaving the steel to cool briefly after heating before immersion in water. It has been suggested that Kirkenar's early experimenting may have encouraged the production of animes, body armour constructed of horizontally articulated plates often associated with Greenwich, as the cooling of smaller pieces was easier to control. Designs for animes appear early in the Album (D.586&A-1894; D.587&A-1894; D.591&A-1894; D.593&A-1894). However, horizontally banded doublets also appear in mid-century portraits of English courtiers, so this feature may be just as much a contribution to contemporary fashion. Most of the armour designs in the album are shown with decorated borders. These were applied to the armour using a technique called acid-etching. The technique creates a characteristic two-dimensional surface decoration to contrast with plainer areas of polished metal. An already-formed object is coated with an acid-resistant substance such as wax, into which a pattern is incised, exposing the metal underneath. The metal is then immersed in a solution of hydrochloric or nitric acid and water until its exposed areas have been eaten away. The resist is then removed to reveal the pattern. Gilding or blackening might be added to accentuate the design. The technique creates a shallow relief making it possible to create highly decorated armour without compromising the structural integrity of the metal. Aesthetically, acid-etching is the metallic answer to embroidery. Many of the designs are shaded in a variety of colours. Armours intended to be of plain steel are shown as white with light blue highlights. Many of the armours in the album are shaded in a deep reddish brown. Where their corresponding armours survive, the armour was heat-treated until it turned an iridescent blue. X-Ray analysis of the armour design for Lord Buckhurst (D.613-1894), revealed the reddish brown colouring to have been made from iron oxides with traces of zinc and lead. Areas of light blue were analysed on the stirrups in the design for Sir Henry Lee's 1587 armour (D.610-1894) and revealed indigo as the source. The use of iron oxides to suggest large expanses of blued steel is likely to have been on grounds of cost or accessibility. The noblemen whose names annotate the pages of the Almain Armourer's Album were the fashion leaders of their day. As the leaders of society they were the chief beneficiaries of sumptuary legislation that regulated the cuts, shapes, materials and decoration of clothing according to status. With their position as noblemen however, came an obligation to present themselves in the most expensive and up-to-date manner. Elizabeth fostered an element of competition at Court. With no king to fear upstaging, her courtiers took up the challenge. Clients paid up to £500 for a decorated garnitue (ensemble) of armour, for which they required a royal licence. Armour was a form of clothing. The exaggerations and distortions it imposed on natural bodyshape flexed and contracted with contemporary clothing fashions. Sometimes armour copied clothing and vice versa. Mostly, however, both responded to the same aesthetic tastes in tandem. The earliest designs in the album show the mid-16th-century fashion for vertically or horizontally banded breastplates picked out with lines of gilded etching resembling the embroidery on contemporary doublets. Broad, square-toed shoes and thigh-hugging leg-defences mirror contemporary hose and stockings. The later armours of the 1570s and 1580, however, are the Album's glory, produced at the time Elizabethan male fashions were at their most outrageous. The puffed and layered clothing fashionable at court is mirrored in the exaggerated billowing of the tassets (thigh protectors) and breastplates, and the etching that decorates them. Bulbous trunk hose were popular in this period. To accommodate them, armoured tassets for the upper thighs took on a broad, inflated appearance, actually extending horizontally from the waist before turning downwards. Later in the century, the hose moved still further back up the thighs to promote long, slender legs in an echo of fashions a hundred years earlier. These glistening armours, decorated using antique and contemporary sources that also inspired ceramics, silver, sculpture, painting and architecture, turned these noblemen's bodies into works of art. These designs show how their armour was at once the embodiment of their wealth, taste, loyalty, authority, athleticism and bravery. The armours were not just for show. Men fought, jousted and skirmished in them, sometimes as organised sport and sometimes in the noisy, terrifying, twisting, chaotic, blood-curdling arena of the battlefield. Grand festivities might include a joust or tournament that was part of a wider theatrical narrative. Sir Henry Lee, became Queen's Champion in 1571, declaring that he would present himself every year to defend her honour. He established the Accession Day tilts, probably in around 1581, which were costly festivals of jousting, poetry, music and feasting all aimed at glorifying the queen through performance. Lee is credited with the choreography and scripts for these events. They revived the entertainments of the first year of Elizabeth's reign when she was flattered with entertainments at Greenwich such as the tourney involving Dudley and other knights heading two armies which skirmished. This mock battle was followed by jousting and foot combat and ended with fireworks and shooting. The designs in the Album, therefore, record armours whose manufacture combined the skills of the artist, the tailor, the blacksmith, the goldsmith, the engineer and the locksmith. Their use demanded the skills of the courtier, the soldier, the diplomat, the sportsman, the actor and the daredevil. The Museum bought the Album from M. C. Stein of Paris in 1894 for 5000 francs. According to the first major publication on the Almain Armourer's Album, Viscount Dillon's <i>An Almain Armourer's Album: Selections from an Original Manuscript in Victoria and Albert Museum, South Kensington</i>, (printed by W. Griggs, 1905), "The history of the MS. is unfortunately somewhat obscure as to its early years. In January, 1725, Mr. Virtue exhibited it at a meeting of the Society of Antiquaries of London. Next, in 1792, Pennant, in his <i>London</i>, reproduced (by the permission of its then owner, the Dowager Duchess of Portland) the drawing of the 1st Leicester suit [D.588&A-1894]. Again, in 1799, Strutt, in his great work on costume, gave a drawing of the suit of the Earl of Cumberland [D.605&A-1894], which he called the Earl of Essex. The library of the Duchess of Portland (a daughter of Harley, Earl of Oxford) was sold in 1786, so we may suppose that the MS. once formed part of the great Harleian Library. From 1799 until its appearance in 1894 in the Spitzer collection, we know nothing of its history. At the sale of that collection, however, it passed into the hands of Mons. Stein of Paris, where the writer saw it and at once recognized the two figures above mentioned. He was interested with its conveyance to England, and the authorities of the Victoria and Albert Museum purchased the interesting MS. A short description of its contents and the identification of various suits still existing in England were given by the writer in Vol. LI of the Journal of the Archaeological Institute in 1895." Two further clues to previous ownership are recorded in the Album. The listing of designs in (probably) an 18th-century hand (D.586A/B-1894) has a name in earlier writing faintly inscribed as 'Mr Wray'. On the back of the design for the Earl of Rutland [D.586&A-1894] is inscribed 'J. West, 1754'. This may refer to James West (1703-1772) of Alscott Park near Stratford-on-Avon in Warwickshire, a Fellow of the Society of Antiquaries, and a collector of books and manuscripts, who became President of the Royal Society, and Joint Secretary to the Exchequer, until 1762. It should be noted that there are three numbering systems for identifying the armour in the album. 1. Folio numbers at the bottom of some of the pages are the earliest numbering. These may date from the first compilation of the pages in the 16th century. Some are not visible where the pages have been cropped by later owners. 2. Page numbers at the tops of the pages record the order in which the album was bound on arrival at the Museum in 1894. As most of the designs occupy individual double-page spreads, the numbers on the designs jump by 4 (eg. 4-5; 8-9; 12-13). The page numbers between are the backs of these designs. In some cases the designs are drawn back-to-back so the page numbers are consecutive (eg. 84, 85, 86, 87). 3. Museum Numbers record each design, rather than each page. Where there is a blank page behind, the number was sometimes inscribed there when the album was new to the Museum. This can lead to confusion when there is a different design on the facing page. The numbering system runs form D.586-614-1894. D refers to 'Drawing'. 586-614 are the individual numbers of each design. 1894 refers to the year of acquisition. 'My Lorde Skrope'. Double-page design from the Almain Armourers' Album, Royal Armouries, Greenwich, compiled between 1557 and 1587, showing a design for an armour and supplementary pieces for Henry Le Scrope, 9th Baron Scrope of Bolton (1534-92) (page nos. 28-29). Note: the main armour design showing the standing figure is on the right hand page of the double-page spread.